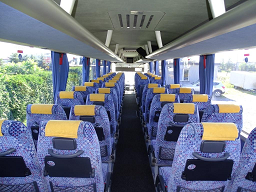 We offer transport and rental of buses, minibuses, minibuses and coaches with driver. We are able to transport 1 to 62 people to any place in Katowice, all over Poland and Europe. We also provide safe and comfortable coach transport for all types of entertainment and sports events such as concerts and music festivals, football matches, volleyball and handball games, boxing, ski jumping and more. We do not restrict our service only to transport to the place. In case of need, we try to provide our passengers with accommodation, meals or restaurant reservations, and if time allows, we also organize a short sightseeing tour of the city where the event takes place. We provide unforgettable impressions and great fun. By choosing Klikbus, you get the highest quality service, safety, comfort, good organization and experience of ours and our drivers. We have a fleet of modern, fully-functional vehicles designed to transport both small and large groups. All orders are treated and evaluated individually. There is no such thing as impossible for us. We listen, advise and suggest. We offer discounts and promotions to our customers.